Watch the presidential debates at CAM Raleigh and help the artist activate the contemporary art museum as a place for open discourse and political engagement. 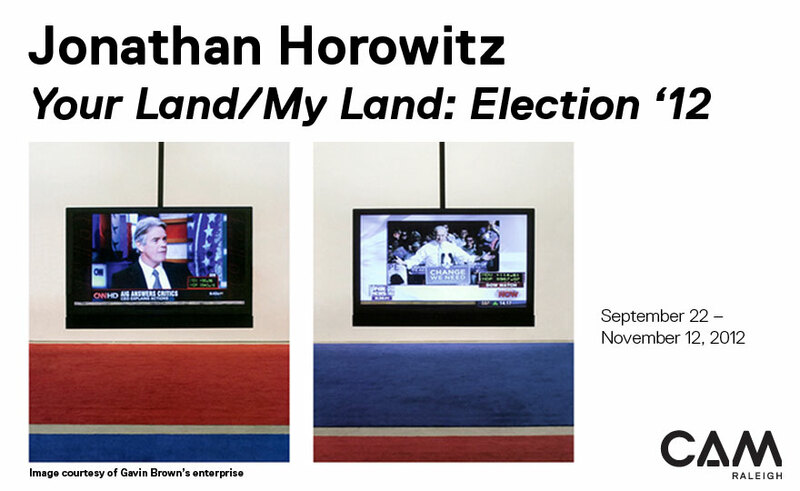 Relax on the exhibition's contrasting red and blue carpets as live feeds of Fox News and MSNBC play concurrently. Connect with museum visitors across the country as they do the same simultaneously at CAM St. Louis, the Hammer Museum in Los Angeles, CAM Houston, the Utah Museum of Contemporary Art, Telfair Museums in Savannah, and the New Museum in NYC. The museum will be open 11:00 a.m. -11:00 p.m.; event begins at 8:00 p.m. Your Land/My Land: Election '12 is generously sponsored by Poole's Diner with additional support from Aaron's. CAM Raleigh is funded in part by the City of Raleigh based on recommendations of the Raleigh Arts Commission.